On Monday I hosted this month's Royal Institution Cafe Scientifique as usual. 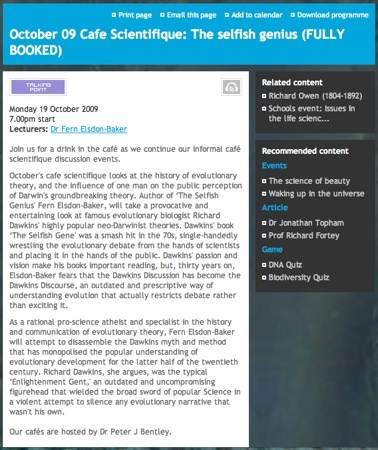 This month we had controversial Fern Elsdon-Baker talking about her book: "The Selfish Genius" which criticises the style and approach of Richard Dawkins in his presentation of evolution. Having worked with Richard I did my best to keep the discussion as balanced as I could; I must admit I was uncomfortable when discussions focussed more on personalities than on science. This was the last RI cafe scientifique for a while. Hopefully we will return next year. Yesterday I was filmed for a promotional video for Apple Education to represent the EMEIA region, as all of their existing material is focused on American universities. They wanted to feature four aspects of UCL - leader, academic, IT administrator and student, and illustrate how apple products are used at UCL, with a focus on digital learning technology and innovation. I was chosen to be the academic in the video (and some of my collaborators were also filmed for the other roles on my suugestion). The filming took some time with a full film crew, and involved me getting makeup to the amusement of others at UCL. My student Arturo was also filmed and asked for a photo to be taken of us both in front of one of the cameras. I should have a link to the video in a month or three once they've done the edit. Some nice news from USA. Apparently my book Why Sh*t Happens (which is known as The Undercover Scientist in most other countries) is a finalist in the 2010 SB&F Prize Young Adult Science Book category from AAAS. SB&F is the Science Books & Films review journal designed for educators and libraries in USA, published by the American Association for the Advancement of Science. I'm not sure what the other finalists are so I'm not holding my breath. There's also some time to wait - according to their website, winners will be announced January 2010. "Winning authors and illustrators will be honored at the AAAS Annual Meeting on February 19 and 20, 2010 in San Diego, CA."